SMALL KUCING: A Surprise From Who? Yesterday afternoon as Mamarazzi was making "Turtle Jelly", the postman came knocking. Hmm...Mamarazzi thought it was photos delivery from eoe Online. But couldn't be ah. The e-mail from eoe Online said 3 working days. Not yet 3 working days wor. Nope, it was not from that company. It was from LVBeii. I wonder what is it. Very "kan cheong". Hand not enough to open the envelope. Use legs also. What? Me boy ma! More ganas one la. Tear and tear everything one la. Can open faster mah. Wow! it's not a book. It's TWO books. 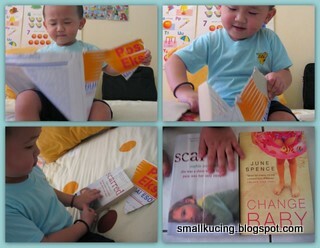 The Lenglui Mummy knew Mamarazzi gila books and she sent Mamarazzi two books. Thank you very much, Beii! wah, make turtle jelly, nak jadi Ninjaturtlekucing liao! LOL! 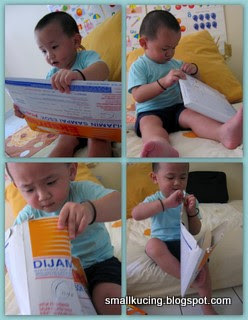 Joshua must be tired of opening presents now and then.. NO ah? ok ok, carry on opening..lots more to come! Jangan jealous...some more this Beii very Lenglui punya. Love the books. Aiyo..the "Scarred" seems to be a very cham sort of story. Wanna read that after I finish with the current one. Now 16 kg already lo. One and a half bag of rice jor .